Coming in a variety of styles, decorative gas heating stoves add comfort, beauty, and value to your home. Enjoy curling up by a warm fire this winter--without the hassle or mess of firewood! Interested in getting a gas stove? Contact us online or call 1-800-888-1045. Read on to learn more about gas stoves. Can I Place a Gas Stove Directly on Wood Floors? Yes. Unlike wood stoves, many Sundance Energy gas stoves can be placed directly on a wood floor with no added heat protection. However, you'll need floor protection when certain gas stoves are placed on carpet or linoleum. Can I Use My Existing Chimney to Vent the Gas Stove? Absolutely! Sundance Energy has special venting kits that can almost always adapt your existing wood stove vent. Will a Gas Stove Work During a Power Outage? Thankfully, yes! Sundance Energy decorative heating gas stoves generate their own power without needing electricity --- assuring you that you'll stay warm through even the harshest winter weather. Can I Connect My Gas Stove to a Thermostat or Control it With a Remote Control? You sure can! We have decorative heating gas stove models (as well as gas inserts and gas fireplaces) that come with a wall-mounted thermostat or hand-held remote control. You can also use a programmable thermostat that can be controlled from any smartphone or tablet. 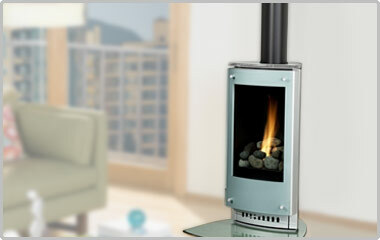 Interested in getting the ambiance, convenience and comfort of a decorative heating gas stove? Contact us online or call 1-800-888-1045.